While chartering in the British Virgin Islands, we learned to always, always, always lock up our dinghy or risk losing it. It’s a habit we took home with us, and to this day we always try to lock our dinghy to something secure like a dock piling or palm tree, even when we’re in our home waters. When we’re anchored out and retire for the evening, we lock the dingy to the stern of Eagle Too, and when the dinghy is on deck, we make sure the outboard is securely locked to the railing. We also make ample use of bicycle locks to secure valuable but portable deck gear like our Rainman water maker and scuba tanks. Due to an unfortunate incident a few years ago where we had someone enter our boat and steal our cash here in the marina while I was up doing laundry, we never even leave the boat without making sure the companionway is locked. Not even to visit a neighbor’s boat for sundowners just two slips over. If our feet hit the dock, the boat is locked. It’s a little sad that that’s the way of the world, but then we sailors do tend to glorify pirates. It’s just that we always think we’ll be the ones doing the pirating, rather than the ones that get pirated. While we try to exercise good dinghy locking discipline, I have to admit the locks we were using would probably be considered “honest man’s locks.” They indicated to a basically honest person that no, this dinghy wasn’t orphaned and in need of a good home, but rather was owned by someone who didn’t care to be parted from it. But if you smacked it with a hammer, pried it with a screwdriver, or possibly even just looked at it angrily, it would give up faster than the French army. Getting some better locks was always one of those things I intended to someday do. 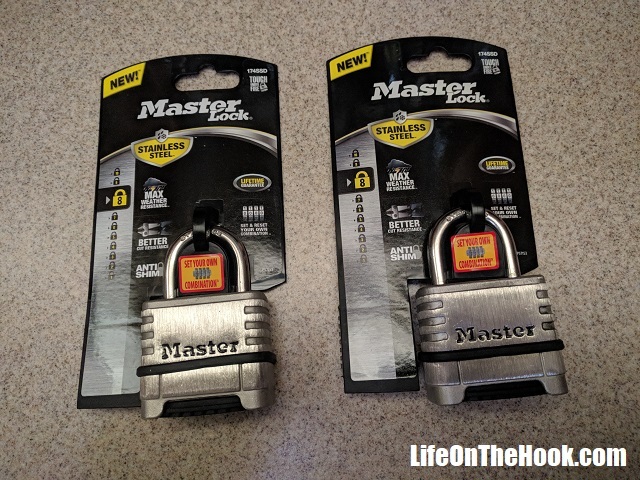 So when we were wandering around Home Depot the other day on an unrelated matter, I was pleasantly surprised to find these new locks from Masterlock. 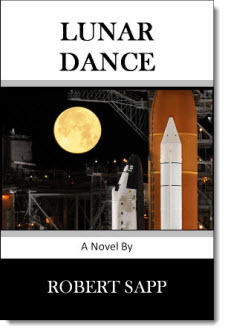 They had beefy stainless steel bodies that looked like they’d be more than able to withstand hammer smacks and prying attempts, and would be better able to stand up to the marine environment than the locks we’ve been using. In addition, they had our “must have” feature, a user settable combination. We just don’t like key locks here aboard Eagle Too, because we’re too likely to misplace or forget the key. Best of all, they were less than $20 each, which seemed like a real bargain. Time will tell if that turns out to be true. While these obviously won’t stand up to a determined assault from someone armed with a pair of bolt cutters or a hacksaw, they should make life much more difficult for “pirates of opportunity” to make off with our dinghy compared to the cheesy little locks we’ve been using. So what’s your philosophy on when, where and how to lock up your dinghy? This entry was posted in How? 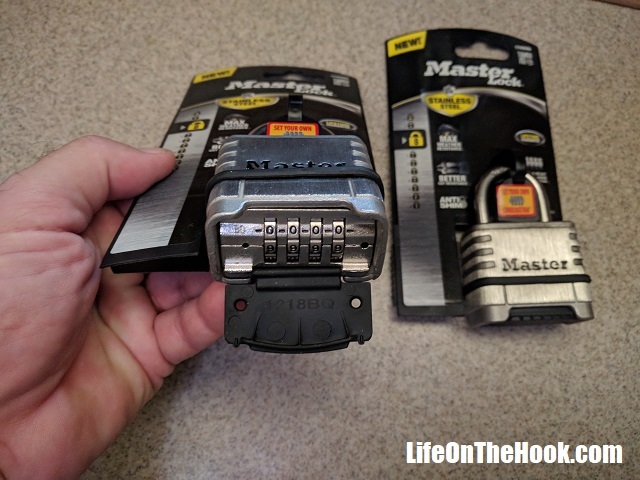 and tagged Locking your dinghy, Preventing dinghy theft on August 20, 2018 by Robert.